Storms, heavy snow and other forces of nature can place a lot of stress on a roof, if not damage it outright. 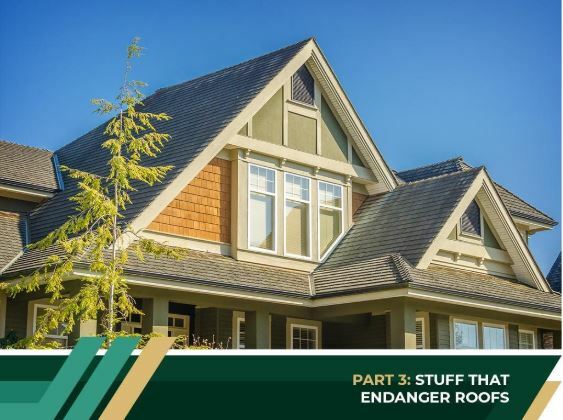 While there’s unfortunately very little you can do to protect your roof from the forces of nature, there are other factors that can damage your roof, which you can easily address. Trees – Is a tree located right beside your home, and are its branches hanging over the roof? If so, then be prepared for dead branches and leaves to pile up on the roof, blocking your gutters and potentially posing a danger to your shingles as well. To prevent this from happening, trim the overhanging branches. Better yet, since trees near the home can fall over during a strong storm and damage both your roof and walls, avoid planting trees near the home altogether. Moss – If you haven’t cleaned the roof for some time, there’s a good chance that moss has grown in some areas. Moss usually grows in humid areas, and it will appear in between your shingles. Not only does moss look ugly on a roof, it will shorten the lifespan of the shingles as well. To prevent moss from growing, you’ll need to clean the roof on a regular basis. Moss is slippery, and you should not attempt to clear it on your own, and most certainly not without any safety gear. Call a professional with the necessary safety equipment to do the work for you. Algae – Algae may also form on a roof that has been poorly maintained. Algae will not pose any structural risk to the roof, but know that spores from the algae can be dangerous to your health. You can scrub it off with a brush. Trimming nearby trees that overhang the roof can also help prevent the formation of algae. Remember to place your safety first whenever you perform any type of roof maintenance. If you’re unsure how to perform this task safely, then it would be best to contact a professional roofer.